Check-in is 4 to 6 pm by appointment (later check in can be arranged), Check-out is 11 am. We have several beautiful guest rooms at the Bayberry, four in 813 N4th the Westfall House and four in 741 N 4th the Garrett House. The Westfall and Garrett Houses are just two doors apart separated by 801 N 4th the Bayberry Mansion which is our third house undergoing restoration, I live in the yellow house behind the Mansion at 411 Madison Avenue. Please scroll down to view the guest rooms. All guest bedrooms are located upstairs on the second floor. Both guest houses and all rooms are non-smoking we do have a smoking area outside at each house. W1, W2, W3 King Room with Fireplace and Private Bath with Shower (note that W3 can also be set up as two twin beds; also rooms W1, W2 and W3 have one cot available each, for a third person; let me know prior to arrival there is a small additional charge). All rooms in the Westfall House 813 N 4th Street, include: A private attached bath, buffet breakfast every morning in the kitchen. We also have air conditioning, TV, free WiFi, smoking allowed outside, and more Amenities. Located in the heart of Steubenville's North Fourth Street Historic district only 3 blocks from Franciscan University. Built Circa 1870, an outstanding example of Italianate Victorian residential architecture. The Westfall Guest House features elaborate brackets, hood moulds, and crests over the windows and front door, and a decorative tower with a mansard roof and decorative iron cresting. This home has had a number of prominent residents including J.M. Freeman, of the terra cotta works c. 1885; C.A. Freeman, secretary of the Central Sewer Pipe Co. c. 1902; H.D. Westfall, vice-president of LaBelle Iron Works c. 1915; and C.D. Simeral, publisher of the Herald Star c. 1929. Large King Room with Fireplace, very small Private Bath with Shower. W1 - Julia's Room - $129 to $159. Beautifully decorated in burgundy and gold. Seasonal gas fireplace, TV, WiFi. One cot is also available that goes across the foot of the bed for a child or 3rd smaller adult for an additional charge per night. Please note this makes the room very cozy, call to arrange prior to arrival. Large King Room with Fireplace, medium Private Bath with Shower. W2 - Hanna & Victor's Room - $129 to $159. Decorated in ivory, gold and mint. King bed and table and chairs, medium sized private bath with shower. W3 - Myrtle & Ivy's Room - $129 to $159. Decorated in a beach cottage theme. This is a split king that can also be set up as two twin (single) beds, please let us know which you want in advance of arrival. Room also has a medium sized private bath with shower. W4 - William's Room - $79 to $159. Queen bed and small private bath with shower. TV, WiFi. G1 - Jacuzzi Suite King Bed, Fireplace, Large Private Bath with Shower and Jacuzzi. G2 - King Room with small Private Bath with Shower. G3 - Queen Room with large Private Bath with Bathtub and Shower. G4 - King Room with small Private Bath with Bathtub and Shower. 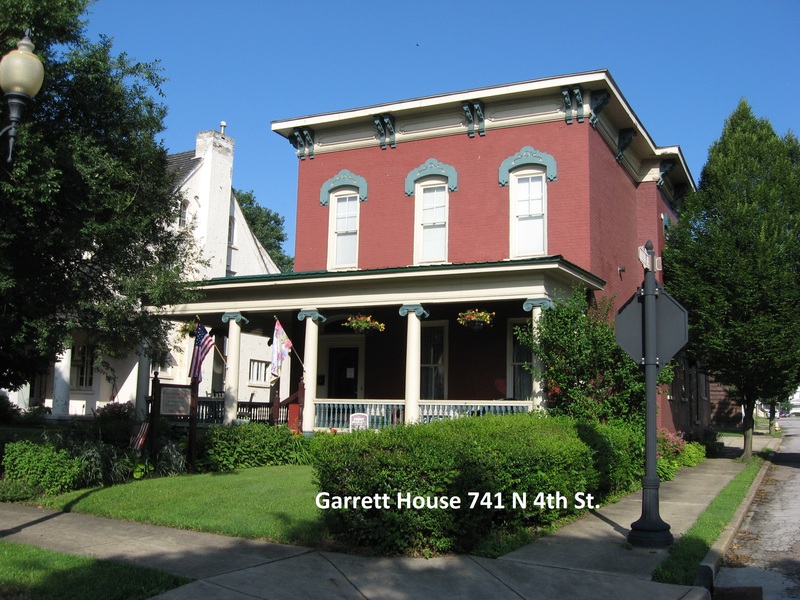 The Garrett House 741 N 4th Street, features our Jacuzzi Suite with private bath and three guest rooms with private bath. All the rooms in the Garrett House include: breakfast every morning in the kitchen. We also have Air conditioning, TV, free WiFi, smoking allowed outside and more Amenities. The rear portion of this home was built prior to 1871 which was uncovered during restoration. The joist and stud construction was all notch and peg without the use of nails and the original home include the kitchen room, room above it and the brick foundation basement below, as well as the large chimney and cooking fireplaces. The Italianate brick with stone foundation home to the front has had a colorful past. Owned by H. G. Garrett in 1871, Garrett owned the Union Savings Institution building where the first telegraph office was located. From 1900 – 1920s the house was home to Frank A. Hare, a local plumber and his son. The home was then used as a meeting place for the Church of Christ Scientists until 1936, change hands several times until becoming an apartment building in the 1970s. Left to deteriorate and the interior in ruins the house has now been completely restored to it's original splendor for you to enjoy. G1 - Francesca's Jacuzzi Suite - $169 to $259. Jacuzzi for two and separate shower. No children in this room or the Jacuzzi at any time please. Medium King Room - very small Private Bath with Shower. G2 - Eleanor's Room - $109 to $159. Decorated in fall colors with a king bed and decorative fireplace. Small Queen Room - large Private Bath with tub and shower. G3 - Audrey & Joseph's Room - $79 to $159. Medium King Room - very small Private Bath with tub and shower. G5 - Derek's Room - $99 to $159. Each room accommodates up to two guests (rooms W1, W2 and W3 and accommodate a 3rd guest on a cot), children are welcome, but please do not bring children without first letting us know, and please see our policies prior to booking with children. Click on Reservations or please call 740-632-2899 to check availability. Bayberry House and all guest rooms are non-smoking and no candles. We have a smoking area outside only. Oil and Gas Personnel are Welcome at the Bayberry and we provide a place to clean your boots with a hose and water in the backyard, and keep them by the front door for your convenience and to avoid getting dirt on the carpets, furniture or in the houses or in your rooms bedding or furniture.